View The Canyons Collection in a larger map. The Canyons Collection is THE most central location for exploring Zion, Bryce, Antelope Canyon, Grand Canyon, Lake Powell, Slot Canyons, Grand Staircase Escalante, Coral Pink Sand Dunes and Best Friends Animal Sanctuary. Get onto I-15 Northbound. Passing through Mesquite, NV and Arizona. You will enter Utah via St. George. After passing through St. George, you will take exit 16 for State Hwy 9 toward Hurricane, UT and Zion National Park. Once in Hurricane, you will turn right onto Main Street. Take the 1st left on UT-59 S. and continue to follow this road until you pass through Colorado City and then enter Fredonia, AZ. Turn Left onto US 89A northbound. 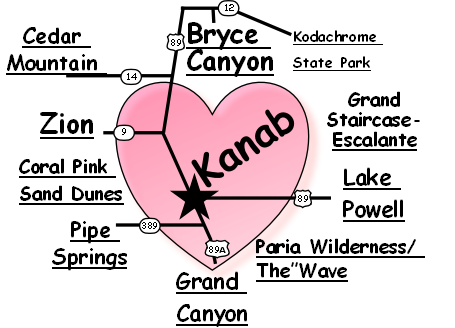 In 7 miles you will enter Kanab, Utah. NOTE: This trip may be modified to drive through Zion National Park - consult map, it will add another 30-45 minutes to your trip and park entree fee of $25. This route is very scenic and worthwhile if time allows. Get on I-15 Southbound. After passing through Beaver, Utah, take exit 95 for UT-20 toward US-89, Panquitch. Turn right (south) onto US 89S and you will drive through the town of Panquitch and continue driving until you enter Kanab. Get onto I-17 Northbound towards Flagstaff and Page, AZ. The road will eventually turn into US 89. You will exit on 89A towards the North Rim of the Grand Canyon and Jacobs Lake, AZ. Follow the road Northbound, US 89A, towards Kanab, UT.